I don't know if anyone posted this already.but i had to post. And history has been made. Well played, SE. Well played. Is Donald really useless or have people been unable to figure out how to make him better? I'm pretty sure there are ways to tweak his AI so that he becomes more helpful. 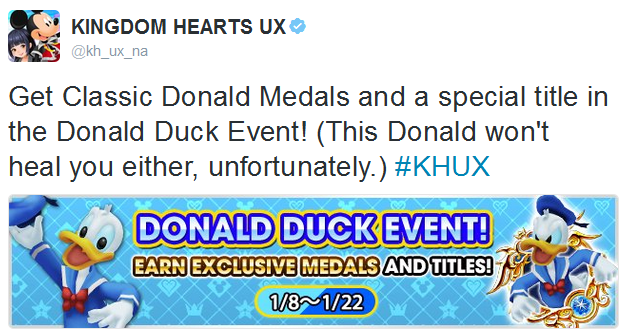 Well Donald is dead like 90% of the fights so that kinda makes healing anyone difficult. And it's not just healing, KH1 is a bit weird anyway when it comes to Donald, at least for me he keeps spamming thunder even after the fight ends. Like, I kill the last heartless, and then he starts casting thunder like three times in a row. Couldn't do that any earlier...? In KH2 he's a fine healer though, haven't had trouble. haha, hey fellow kids! SE social media manager here! I'm sure you've all died a lot in KH from Donald not using the "Heal" spell on you, as I've seen in the "memes"! I too, as a fellow player of KINGDOM HEARTS, have died from Donald not healing me! on an official level this is happening????????????????????? Every KH Player: "Donald stay alive and heal me!" Little did we know it's always been intentional and they're just trying to hide it by admitting it now. But he throws ethers at me when necessary so kinda tolerable. Okay but what the heck I just learned that Tarzan heals...?? I've never used the world specific party members because as a kid I didn't realize D&G still level up even if you don't use them, and then I grew to like them and never wanted to switch them out but. Next time I'm facing Clayton Doland is OUT. I just saw a video of someone beating him on lvl1 and Tarzan was delivering those heals like a champ. I wish that was the same for me. Most of the time when he heals me is when I just â€‹died. I also learned that thing two years trough an LV1 video when I was doing research for my own LV1. I think I kept both Tarzan and Donald in the part so they could heal and made it so that they could not use any of their special attacks. So all the MP that they`d use would go to healing. It helped me survive Clayton and Stealth Snake, which might the hardest story boss combo in the game. Like, I raged so much when I fought them on Lv1, they were super hard.